Students in 4K – 6th grade have general music two times weekly. Music follows a structured learning program which includes Concept Development, Listening Skills, Music Reading, Movement Skills and Performance Skills. A few highlights include 4th grade students learning the recorder. They perform at the Christmas Program and Grandparents' Day. Our 4K – 6th grade students perform at the Christmas Program every year and sing selected songs for Grandparent's Day. The students also rehearse for liturgy during music class. 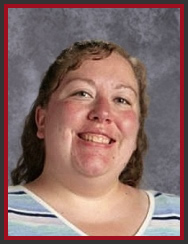 My name is Mrs. Langenhahn, and I am the 4K - 6 Music/Band teacher. I graduated from UW-Stevens Point with a degree in instrumental music education. I live on a farm in Marathon with my husband, Chris and our sons, Austin and Emmett, and Beagle, Bella. I do lots of music things, but I also like to read, to bake, and make scrapbooks. I really enjoy teaching at St. Mary's. Stop by the room any time!